Ten investigations into the death of Subhas Chandra Bose reached the same conclusions. One committee, fifty years after the event, contradicted them all. Why? In 2015, the West Bengal government released all the ‘Secret’ files related to Netaji Subhas Chandra Bose from its state archives. The Central Government followed suit in January 2016, declassifying the remaining 304 files on Bose – bringing the final number to 2,324. On March 2, 2016, the government declared in parliament that there were no more classified ‘Netaji files’ left in its archives. From these files, we now know that between 1945 and 1974, ten investigations took place – conducted by the British Army, by the Allied Command based in Japan, the Government of British India, the Governments of Japan and Formosa, the Government of India, and also by individual journalists and followers of Bose. All of them concluded that Netaji died on the night of August 18, 1945, after being grievously injured in an aeroplane crash at Taihoku (Taipei) airport. However, even after these direct inquiries by recognised authorities at home and abroad, many Indians could not accept their findings. In 1999 – half a century after the incident – the Vajpayee government appointed a third commission, led by retired Justice Manoj Mukherjee, to get to the truth that all the others had apparently missed. The Justice Mukherjee Commission of Inquiry (JMCI) concluded in 2005 that there is no proof of a plane crash at Taihoku airport on August 18, 1945. Mukherjee also concluded that Netaji “did not die in the plane crash” and “the ashes in the Japanese temple are not of Netaji”. Although tasked to find out how, when and where Netaji had died, the JMCI did not provide those answers. Public memory is short, and the JMCI has gained quite a bit of support over the last decade. But a detailed examination reveals a great deal about the basis of its conclusions. In his report, Justice Mukherjeewas prudent to note, “If really there was a plane crash … the news about the same would have been published in the then local daily.” (para 4.12.12 of JMCI Report). He then referred to the Central Daily News, which had carried no report on any plane crash at Taihoku in late August, 1945. This was Justice Mukherjee’s first big mistake. He assumed that the Central Daily News was a local daily of Taihoku in 1945. In reality the Central Daily News was the official newspaper of Chiang Kai Shek’s nationalist party, the Kuomintang, and was based in Chongqing – on the Chinese mainland. It became a local newspaper of Taipei only after 1949, when the Kuomintang was defeated and fled to Taiwan. 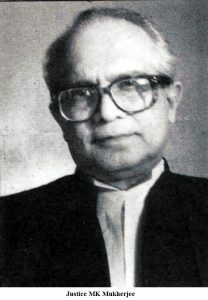 Justice Mukherjee had referred to the wrong newspaper and failed to find evidence there of the crash. This fundmental flaw led him toward further erroneous conclusions. In 1956, the journalist Harin Shah had deposed before the Shahnawaz Committee, sharing the names of two local newspapers, the Taiwan Didi Shimpao and Taiwan Nichi Nichi Shimbun–which had indeed published news of Bose’s death due to the plane crash. Shah and a Japanese witness, Komatsu, also mentioned that “a small obituary notice appeared in the papers”. Shah’s testimony was available to the JCMI. Yet Justice Mukherjee never examined these newspapers, nor even mentioned them. Separately, the JMCI ignored the government of Japan’s record that Lt General Tsunamasa Shidei – one of the co-passengers on the plane – was killed in a crash at Taihoku on the same date. Perhaps the most dramatic misrepresentation in the JMCI is in para 4.6.3.ii. 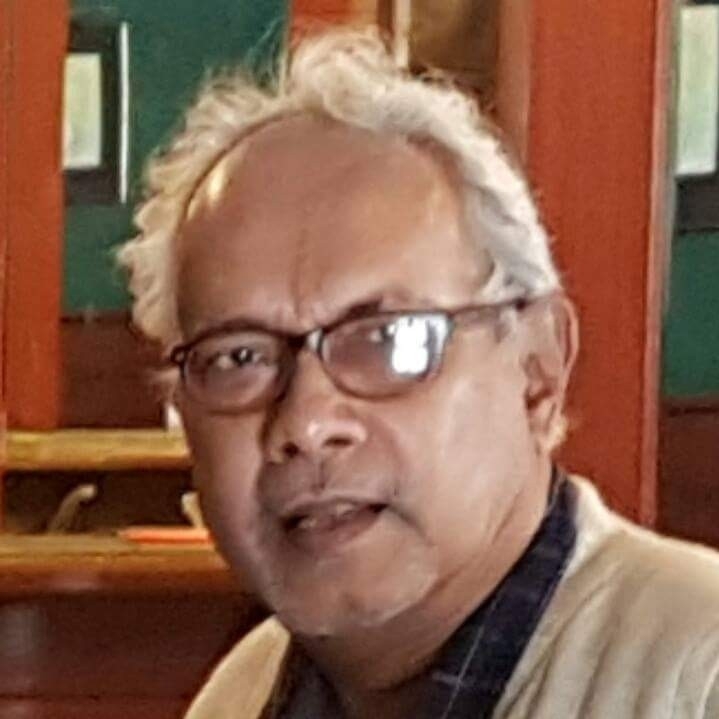 There, Justice Mukherjee writes: “As testified by SW4 [Habibur Rahman, to the Shahnawaz Committee], the plane had nosedived from a ‘fairly high altitude, possibly over 12-14,000 feet’.” He concluded that Habibur was bluffing, as seven of the thirteen passengers had survived the crash – implausible, if the plane had fallen from that height. However, Habibur Rahman had never made this claim about the plane’s altitude. Where did this ‘12-14,000 feet’ statement come from? In the 1956 Shahnawaz Committee report, it is written that Habibur narrated that they were flying at 12-14,000 feet from Touraine (now Danang, in central Vietnam) to Taihoku – their previous flight – not after taking off from Taihoku. The JCMI noted that in March 2003, the mayor of Taipei – in reply to a question from an Indian journalist – wrote that “there is no such records (in Taipei City Archives) of a plane crash in Taipei on that day”. “Unfortunately, after reviewing all handed-over records during the period from 8/14/1945 to 10/25/1945, there was no evidence shows that one plane had ever crashed at old Matsuyama airport” in Taipei. The Taiwanese authorities had explicitly stated that that their report was based on limited ‘handed-over notes’, and that Japanese authorities had retained control until October 25 – well past the date of the air crash. Justice Mukherjee concluded against the plane crash based on incomplete data. But absence of data in limited records is not proof that an event never happened. Only two people were eyewitness to both the death and cremation of Bose: Habibur Rahman and the interpreter Juichi Nakamura. Both had deposed to the Shahnawaz Committee in 1956 that Netaji was cremated on August 20, 1945. Dr Yoshimi, the hospital doctor, testified that the body had been taken from the hospital on the same date. Habibur added that he had collected the ashes the following day. 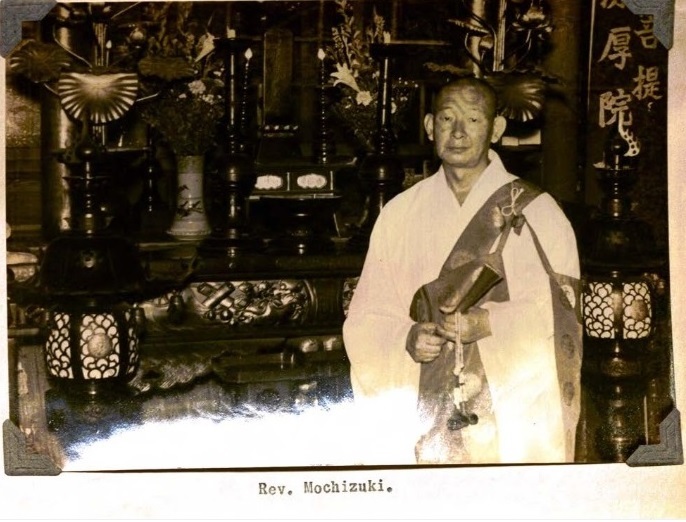 While the death certificate, supposedly signed by Dr Yoshimi, has never been retrieved, the Cremation Register of Taihoku Municipality records that four males were cremated between August 19-21. Justice Mukherjee failed to unearth the details of these four individuals. Instead, he obtained details of another male deceased, Ichiro Okura, who died on August 19, 1945 (the day after Bose is said to have) and was cremated on August 22 (two days after Bose, as deposed by Habibur Rahman and Nakamura). The journalist Harin Shah had speculated that Okura’s body might in reality have been that of Bose, cremated incognito. The JMCI report concluded that Okura’s death and cremation had been “passed off as those of Netaji”, and rejected that conclusion. That is, it only referred to Harin Shah’s report in order to reject this detail – while ignoring Shah’s more crucial information on Taihoku’s local newspapers. 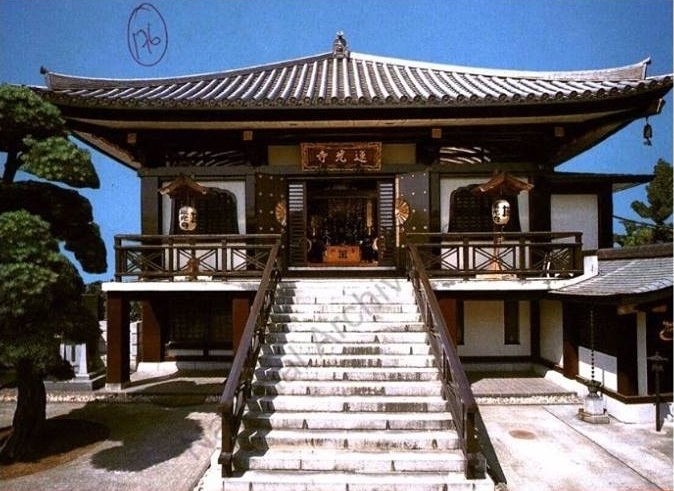 On August 13, 2003, the Home Ministry authorized the JMCI to evaluate the feasibility of a DNA test of the ashes stored at the Renkoji temple in Tokyo (para 2.8.6). Some experts did advise that less-charred bone pieces, if present, might be usable for a DNA test. Accordingly, Justice Mukherjee wrote that he wanted “active co-operation of the Temple authorities”. The request was sent to the chief priest of Renkoji by the Ministry of External Affairs (MEA). 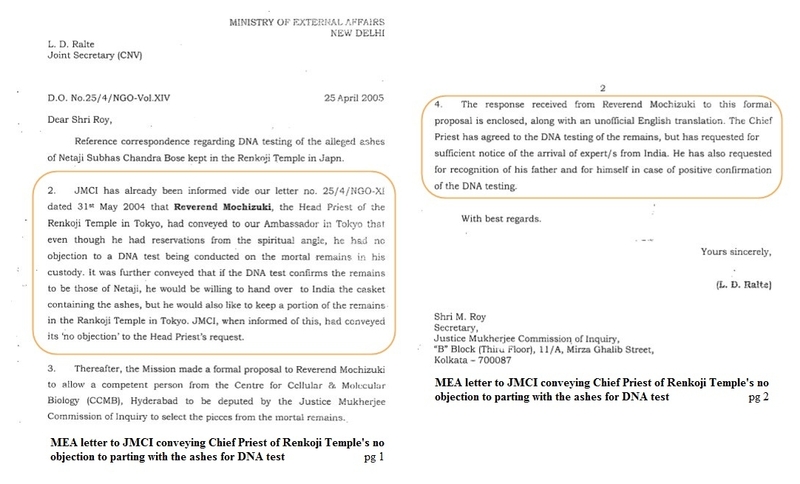 In letters dated April 25 and May 31, 2005, the MEA informed the JMCI that the chief priest “had no objection to a DNA test… on the remains in his custody”. 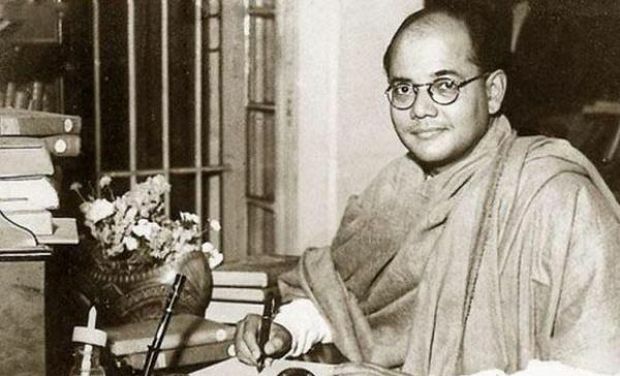 His only requests were that “he would keep a portion of the remains in the temple” and that, in recognition of their dedication in keeping the ashes for sixty years, his name and that of his father, the chief priest before him, be engraved on the pedestal of Netaji’s statue in India. Yet despite being informed that the chief priest had consented, the JMCI wrote another letter to the MEA on May 20, 2005 – asking it “to persuade the Temple authorities to accord their consent to selection of potentially less charred bone pieces from the casket” (para 2.8.10). The MEA apparently took no cognizance of this letter, and the Commission – six years into its tenure – was wound up over the following months. In his report, Justice Mukherjee concluded (rather unjustly) that he could not proceed with the DNA test “on account of the Temple authorities’ reticence”. These errors, of ommission and commision, raise the question of whether the JMCI was looking for those leads that could be construed as contradicting the previous Inquiry reports. 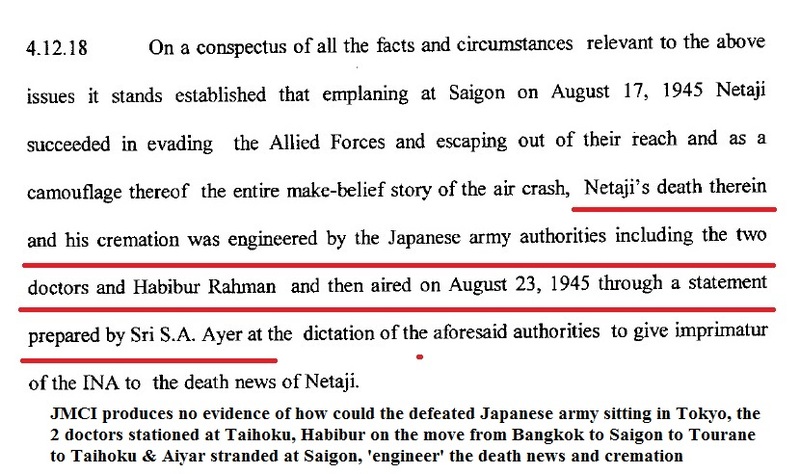 “… Netaji’s death therein and his cremation was engineered by the Japanese Army authorities including the two doctors and Habibur Rahman, and then aired on August 23, 1945 through a statement prepared by Shri S.A. Aiyer ‘at the dictation’ of the aforesaid authorities to give imprimatur of the INA to the death news of Netaji.” (para4.12.18). and then maintained their supposed secret – in the face of repeated investigations over subsequent years and decades. And the Japanese motive? The JMCI gave no answer. When the report was tabled in parliament, “Short Duration Discussions under Rule 193” were held on May 18 and July 26, 2006. Prabodh Panda of the CPI and Subrata Bose of the Forward Bloc respectively made half-hour and ninety-minute-plus speeches. The government gave replies to Panda’s nine-point and Bose’s 23-point questions. Thirteen parliamentarians, from across parties, joined in the discussion. Twelve General Questions were answered. 1. No source supports the Commission’s claim that the aeroplane had attained a height of 12-14,000 feet before nose-diving. 2. The JMCI had said that Dr Yoshimi shared a death certificate in 1988 (para 4.8, pg. 77) “which cannot but be a manufactured one”. This conclusion was not valid. The evidence provided by Dr Yoshimi to the earlier investigations was found to be consistent and it was not credible that he would manufacture a death certificate merely to put the JMCI on the wrong track. Besides, the copy of the certificate accessed by the JMCI was in English. The report does not indicate whether they examined the original certificate. 3. The JMCI did not investigate the antecedents of Ichiro Okura, or try to establish that there was a real person of that name (to disprove the theory that it was in fact Bose). 4. The Commission has not given sufficient grounds for its conclusion that Netaji was dead. At the end of the several deliberations in parliament, on August 7, 2006, home minister Shivraj Patil explained that the JMCI had not completed its primary mandate – answering where, when and how Bose died. In addition, glaring shortcomings had been exposed in its investigation. Hence, after taking due care of all observations, the government would reject its findings. Many today still hold the view that the goverment rejected the findings of the JMCI without explanation. This belief is so prevalent that in 2006, 43 members of the Bose family issued a statement urging the government “to provide a full explanation for its rejection of the JMCI Report”. Thus, although ten investigations have concluded that burn injuries from the aeroplane crash led to Netaji’s demise on August 18, 1945 – and one was inconclusive – conspiracy theories continue to swirl through social media, fantasising over the final phase of Netaji’s life, and turning one of India’s greatest sons into the victim of a cheap whodunit. Sumeru Roy Chaudhury is an architect graduated from IIT, Kharagpur. He was the Chief Architect of the CPWD. He thanks Anirban Mitra for his assistance.